Last weekend I cut and started sewing my coat Origami, I did so well that I found myself stuck on Sunday morning due to the lining missing (ordered it a few weeks ago)… And I could not do anything more without it. Frustrated at not being able to continue sewing this coat, I decided to sew Petite Chérie a dress, the dress eventually became two dresses. I wanted to satisfy my urge to sew so I used a dress pattern from Ottobre that I had already traced, the same as for the straight A’s dress. And that way I also celebrated the good news of the weekend: Ottobre magazine will soon be available in French. 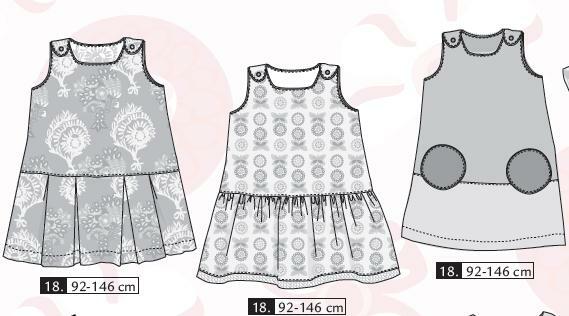 Here is the pattern, it has three variations : “Tropical Blend” from Magazine Ottobre 03/2011. This is a fabric that Petite Chérie’s aunty Isa gave me two years ago. 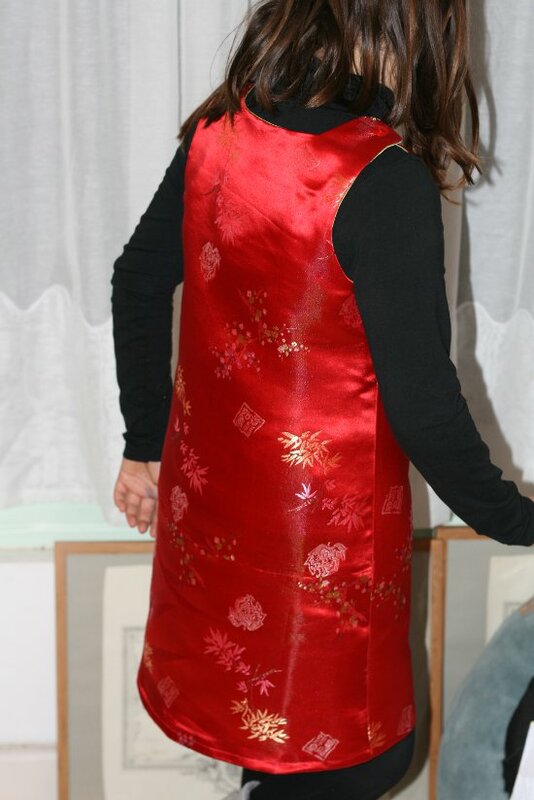 It’s red with Chinese embroidery. DD chose it in my stock. 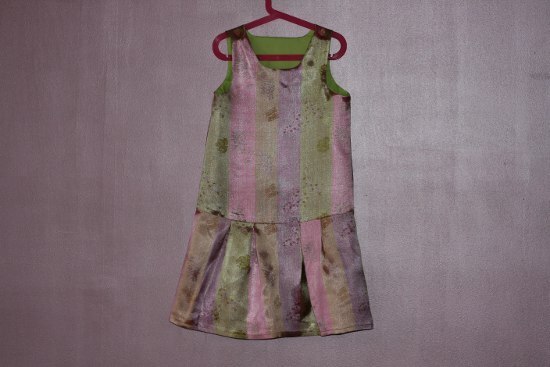 This is not an ideal fabric for a dress because it is rather stiff but Petite Chérie wanted it, so I used it. It’s a pain to press/steam though… And it shows! I was going to cut it when my daughter pointed out that the wrong side was “beautiful, too.” It was different from the front : strips of colors with a moire effect and the same embroidery as on the right side except it was in white. 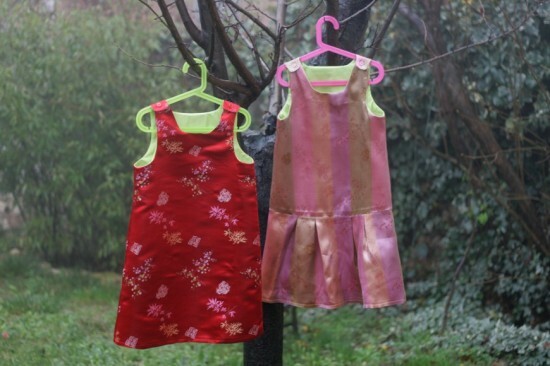 As a result I made two dresses! With stripes (wrong side) with a pleated skirt. In red (right side of fabric) a simple A-Line version. I attached the pattern piece of the skirt to the pattern piece of the top of the dress to use it as one piece. Well except for the back : I did not have enough fabric to cut everything in one piece so I added the skirt panel separately. 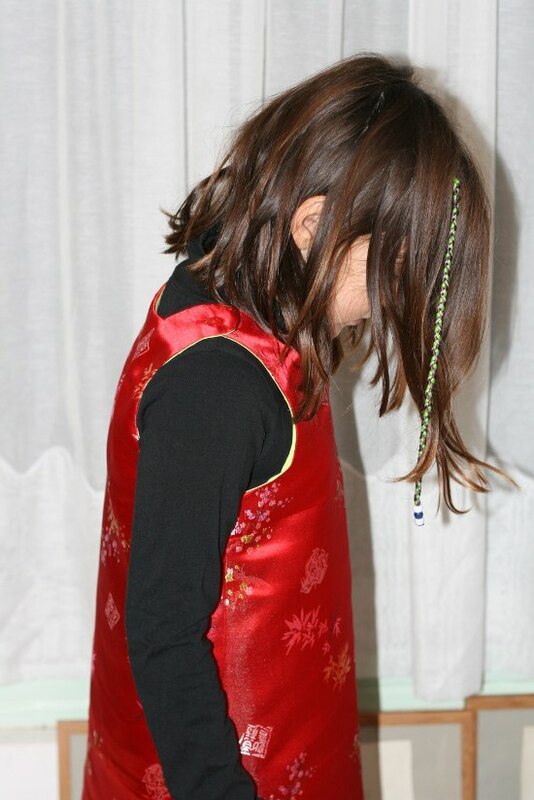 I admit I did it “quick and easy” : a simple green cotton for the facings, no piping at armholes and necklines, and I picked basic buttons in my stash. Nothing like a pattern already tested, approved AND traced to satisfy an urge of sewing. You’ll see this pattern again, I have at least 2-3 fabric combinations that I set aside for this pattern. But I think I’ll trace a larger size next time (DD keeps growing ^^). Monday morning I was happy to find in my mailbox the lining fabric for the coat which means that I will finish it on Sunday! Yay! So… Since last Saturday it’s rain, rain, rain… The pictures took inside produced weird (and bad) results (see below) so I took advantage of a few minutes of calm weather to take pictures… In the fog! 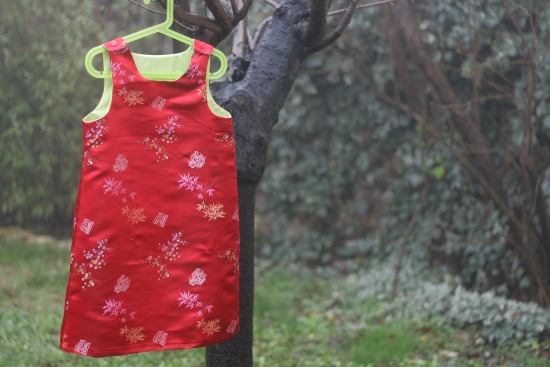 Petite Chérie is a fan of the red dress and wants to wear it for Christmas … But of course any opportunity is to be seized to wear it (“Mom, I can put it on to go to Grandma’s?”… She goes to grandma’s every day…). Chameleon Dress. Pictures indoors, with flash, against a crushed-raspberry-satin wall, don’t work ! It’s time to cut the summer plait, chérie ! 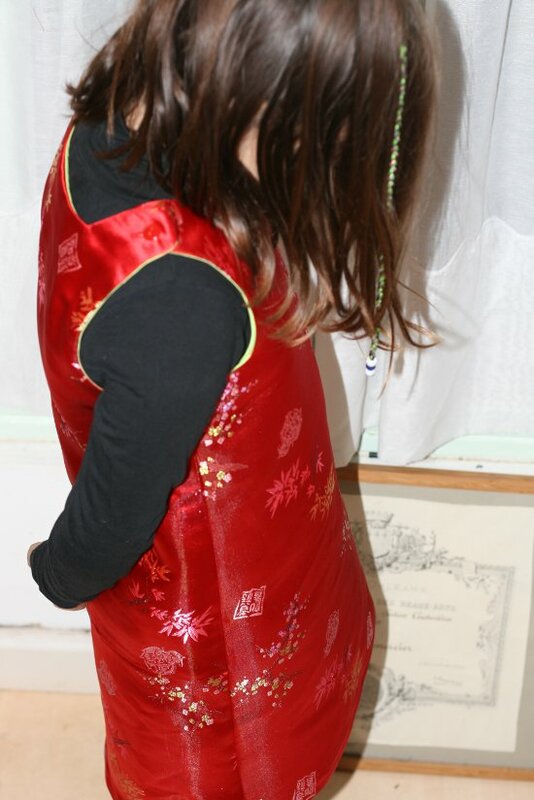 Looks like a Chinese tunic here, no ? 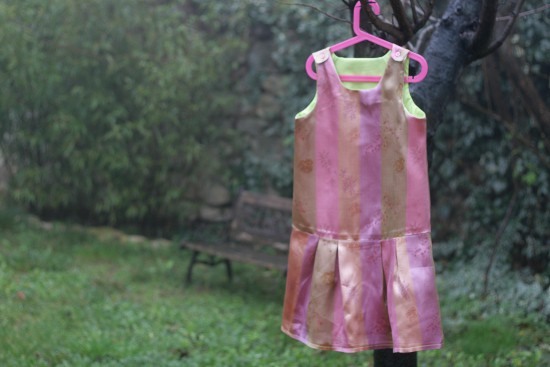 This entry was posted in Blog, Children Clothes, Sewing Projects and tagged Ottobre Design by Véro. Bookmark the permalink.